100% Wild Ecuadorian Criollo Arriba Cacao 16 oz. 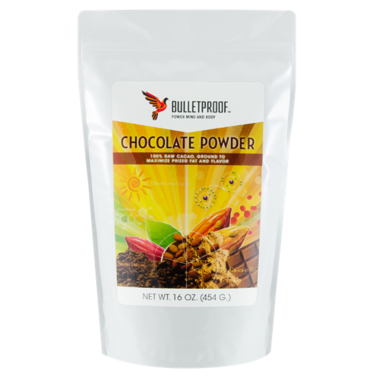 This Bulletproof Chocolate Powder is 100% raw cacao, ground to maximize the fat and flavour content. This is quite possibly the best chocolate/cacao powder you will ever eat. It is strong, rich, powerful and sooooo chocolatey! In my opinion, with Bulletproof Chocolate Powder, you will never need to drink coffee again. Just make yourself a hot chocolate in the morning, with some coconut milk, and you will have all the energy you need. It's a very superior product and definitely worth the price! This is the best chocolate or coco powder. I make hot chocolate with it. I use it in baking. It's not very sweet which I love. I would definitely reorder it.